Grant E Cook enlisted in the Army in 1943 at Fort Custer, Michigan. He was twenty years old. From there he traveled by rail to Camp Adair, Oregon to the 274th Regiment of the 30th Division. He requested a transfer to the 96th and was soon assigned to F Company 382nd Regiment. In November the division moved to Camp White, Oregon. “We of the 96th Division have a clearly defined task. It is to become a well-trained combat division in the shortest time possible. We must keep our eyes, our thoughts on that goal. Any time spent on efforts which do not lead to that goal is time wasted and we have no time to waste. This is the kind of division we are going to be: a well-trained, tough physically and mentally ready and eager to fight, not for personal glory or advancement, but for the honor of the division and the service of our country. We kill or we get killed”. At Camp White he took basic training and advanced rifle training in the mud and snows of winter for weeks at a time. It is where boys are disciplined and toughened to become men, by doing their share of marching, calisthenics, KP, guard duty and yes pushups. They go through rigorous obstacle courses and crawl under live machine gun fire. They march with weapons and heavy packs on their backs while simulating battle conditions. They learn to be responsible for themselves and their buddies, follow orders and work together in the squad. Soldiers belong to Uncle Sam and this is drilled into them day and night from Reveille to Taps and up at 3:30 am for KP and get back exhausted to the hut at 9:00 pm. The men in this group represent 1/3 of his company of 186 men. Some will die in Leyte and some on Okinawa for a total of 70. The total of men that served including replacements is 407. Total Purple Hearts is 320. As recorded in book.Fox Company has a book called the Fighting Foxes put together by several men in Fox Company and illustrated by Staff Sergeant Gerald Cookston. Officers up and down the line were also trained to work together from the platoon to battalion and regiment, and this took time and effot of all soldier. Cook had a total of one year of this training. 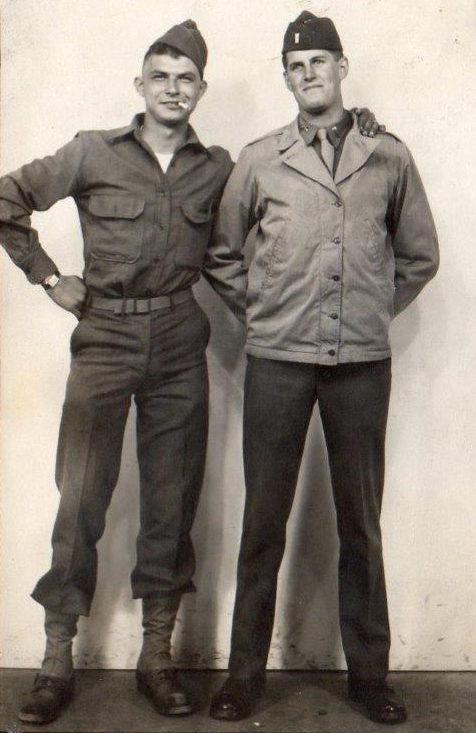 It was soon time to get ready for amphibious landings and Grant went with Fox Company to Camp San Luis Obispo and Camp Callan, California to train. They had landings with small craft and also simulation from shipboard. This training was effected by the US Marine Corps. It was July of 1944 and the time to leave the country had arrived. The Deadeyes made a nostalgic trip by truck convoy down through San Francisco where the men of Fox Company boarded the USS Sea Marlin. They sailed through dangerous waters and hundreds of the men had been seasick. They arrived in Honolulu, Oahu, Hawaii and settled into up their huts at Schofield Barracks for six rigorous weeks of jungle training, more practice landings and indoctrination. They next boarded the troop ship USS Warhawk which stopped at Eniwetok for fuel in September, sailed on past Manus Island and then made an assault landing on the beaches of Leyte, an island in the Philippines on Oct 20th. 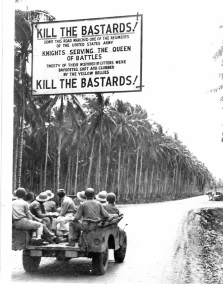 The Pacific war was taken to Leyte. MacArthur promised he would return and the XXIX Corps with the Deadeyes were chosen to help retake the island. Extensive plans were made within the Division, Regiments, Battalions and Companies to take on the Japanese. This battle would include 250,000 Americans and 70,000 Japanese. Leyte was needed for its landing strips and staging areas to take on the battle for Luzon which was loaded with Japanese troops. F Company landed under the protective cover of artillery and their first taste of combat took them into succession of little towns in the tropics. 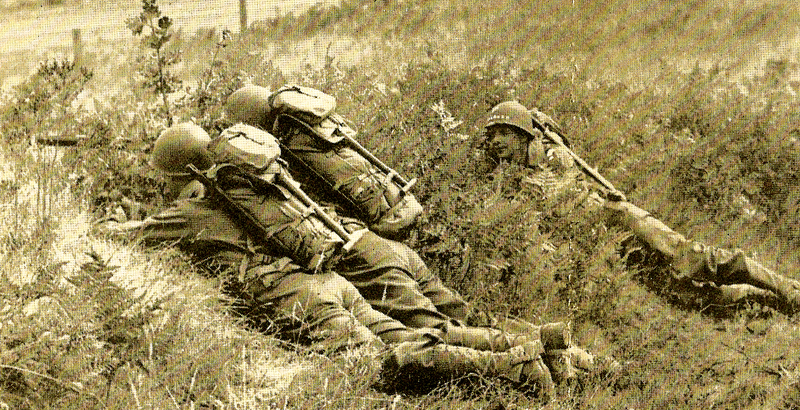 Tiebau, Anabung, and Pikas lie in front of them on their section of the front line. 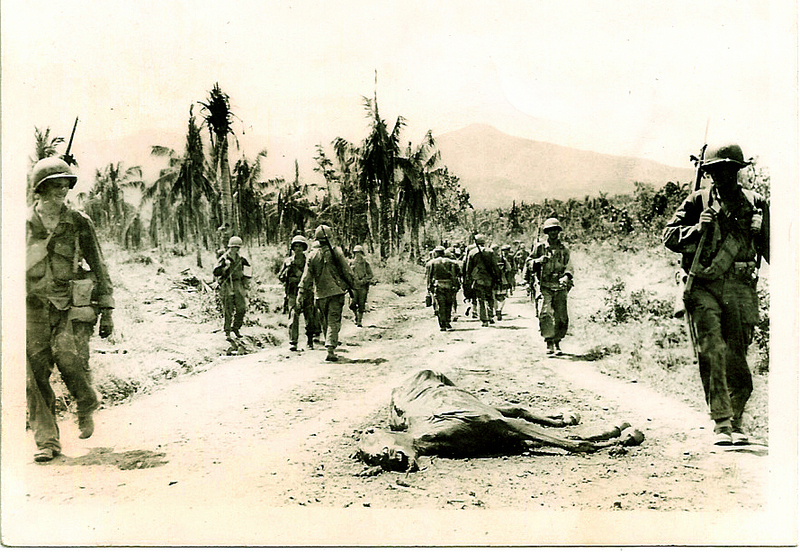 By the 26th of October those small towns were secure and F Company joined in the Regimental attack of Tabontabon. Col Dill their Regimental Commander was there leading the troops. Infantrymen had to ford a knee high river on the east side of the town before the attack could begin and were soon pinned down by enemy machine gun fire and had to call in for support. This proved to be a big battle as Japanese were ready everywhere. Sectors where Americans would be had been zeroed in and machine guns and artillery were cleverly designed to deliver intense fire. They were hard to detect being covered up with layers of coconut logs and vegetation. Some emplacements had been constructed under civilian huts, and many snipers were high up in the trees. Our commanding officers directed the attack with barrages of artillery, heavy mortar and machine gun fire before rifle squads could move in. They attacked with rifles, hand grenades, mortars and advanced through the brush and marshes on foot, while dodging snipers and suicidal Japanese soldiers. Tanks were used whenever possible as well as pin pointed air strikes, as needed. The Japs came yelling in one night with a bonsai attack and our mortars and artillery killed most of them. 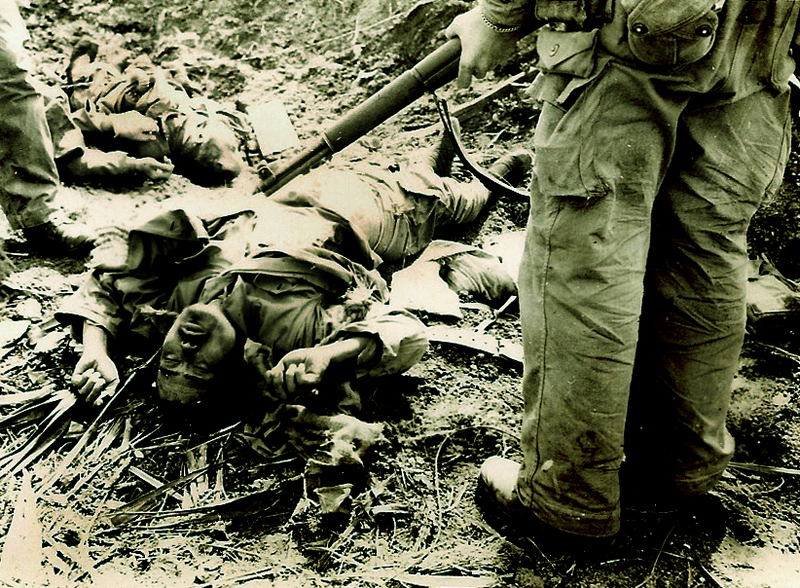 Japs could be heard in the brush pulling back their dead and wounded. After the Deadeyes took the town of Tabontabon they moved on in the countryside, and began sending out reconnaissance patrols. On Nov 4th Fox Company moved in on Meechem Ridge. There was a string of pillboxes at the top. 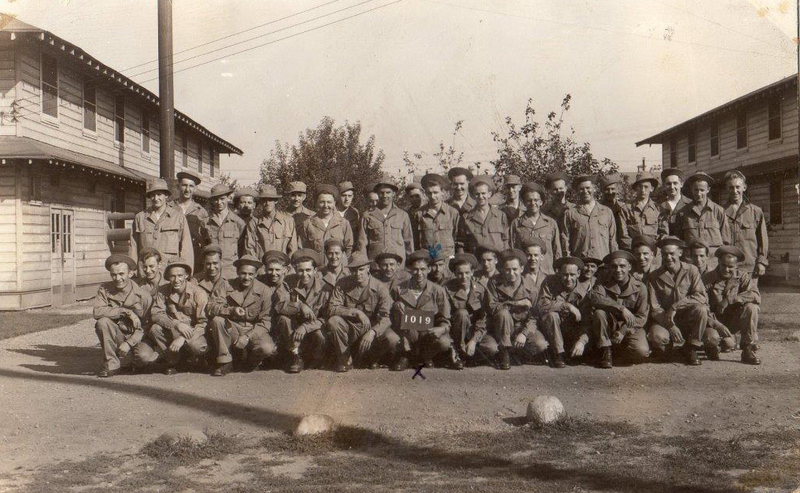 Fox Company men moved up 500 yards of slippery jungle grass killing enemy and dodging bullets. This proved harder to take than Tarontabon because of its terrain. Slippery slopes made it hard to get supplies in and wounded out. After this crest was secured Fox Company had about four days of rest and later headed for Ormoc with the Regiment. Grant had taken in a new buddy; a small monkey that give him a new reason to live. We do not know where, but Grant was severely wounded by artillery shrapnel and shipped to an army hospital (possibly) in New Guinea,	because of the severity of his wounds. We also learned that he suffered with malaria, dengue fever and jungle fungus.he battle for Leyte continued to rage without Grant with losses on each side. Throughout this ordeal Grant and his family kept up a steady line of letters. When he was wounded his mail home was delayed and he received a V-letter from his mother fearing the worst and wondering where he and his monkey were. When the battle was over, over 500 Deadeyes had lost their lives, hundreds lie wounded in hospitals, and 7,700 Japanese had been killed. 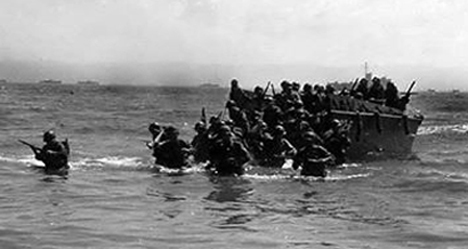 Combined American forces had secured the island by December and eliminated 48,790 enemy troops. This was bloody warfare, and Deadeyes prevailed. When my Dad, Grant Cook, returned to Hamtramck, Michigan after the war he married Lois Linbeck. They moved to Lansing, Mi. so he could attend agricultural school. After that, they moved to Midland County and found a small cabin in the woods where they lived for a few years and started their family. 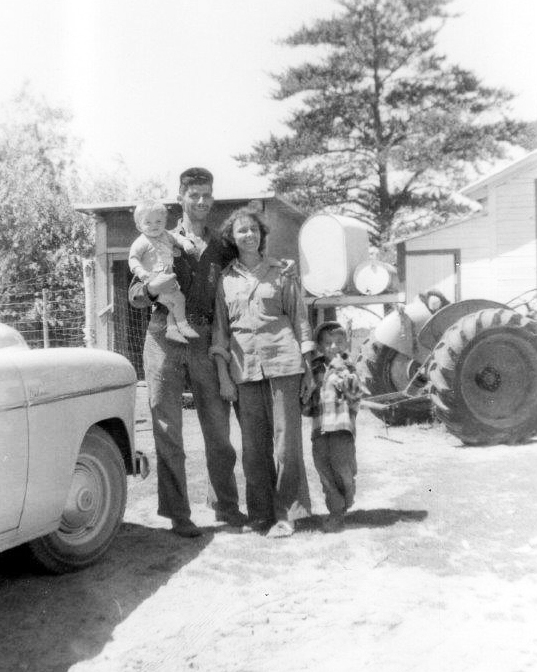 They then purchased a farm a few miles away in Gladwin County and began a dairy farm. While living there, Grant and Lois raised eight children along with several pets, the cattle, ducks, geese and horses. Later on he worked at Continental Can Company, a manufacturer of fiber drums. This homestead which they referred to as “the farm” was very important to Grant as if it was a part of him. Both Grant and Lois lived out their lives there. Grant loved to go hunting and fishing. He was very passionate about these sports and was willing to teach anyone who was interested. With unexpected patience, he taught his sons and a couple of granddaughters how to shoot rifles; practicing until you could get a bull’s- eye. When talking with my Aunt Colleen, Grant’s sister, she said that he came back from the war a changed person. I think anyone would who had to go through combat and see and do the things required of our soldiers. 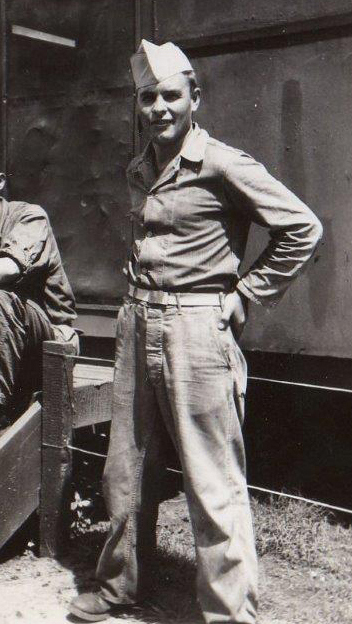 He also lost his brother, August (Augie), who was in Italy during the war. My dad would talk about how he and Augie did everything together even though they were complete opposites. His favorite example was how Augie could put on a burlap sack and make it look like an expensive suit, but my dad would wear the expensive suit and it would look like a burlap sack. Grant would tell me how much he wished my Uncle Augie could have been around to be an uncle. I feel as if my dad never got over losing his brother. Grant never wanted to talk about the war until his later years. He said he didn’t want to lose the history of what he went through during the war and I could tell that he was proud to have served and to have been a Deadeye. During my dad’s last couple of years, I would help him cut and split wood for heating. We would just work together and talk about anything and everything but had to take a break once in a while to have a Red Dog beer. I would love to be able to do that again, I miss him very much. Grant with all his training was not ready for combat; no one is. Being in a situation where you kill or get killed cannot be replicated. Only combat teaches the infantryman how to cope and comprehend by juggling reasonability and survival. Training helps the response. Grant prevailed and what you read from this narrative and hear from his recorded experiences is but a part of his story of survival and being a responsible soldier. We can respect him for that. Typically Army infantry advances with the purpose of having the least amount of casualties, so caution is used whenever possible. However it is the riflemen who have the most vulnerability, and the most casualties which includes commanding officers. And let us not forget the beloved medics move in to help the wounded and carry men to aid stations all while under fire. Grant learned that combat effort often continues for hours of searching, firing, dodging, seeking cover and seeing buddies die or lay screaming for help while men and their squads advance and slug it out with the enemy right out in front of their eyes. Sergeants shift their men and alert them to throw grenades and advance over hills with bayonets drawn, as enemy artillery shells scream in on them and spread searing shards of shrapnel, as their men hit the dirt and pray to God above that it is not their time to die. During the last weeks of battle the Japanese soldiers on Okinawa were without rations and medical care. They often infiltrated the front line units looking for food and to kill any Americans they could find. Soldiers see death and dead bodies and adjust their thinking to the reality at hand. 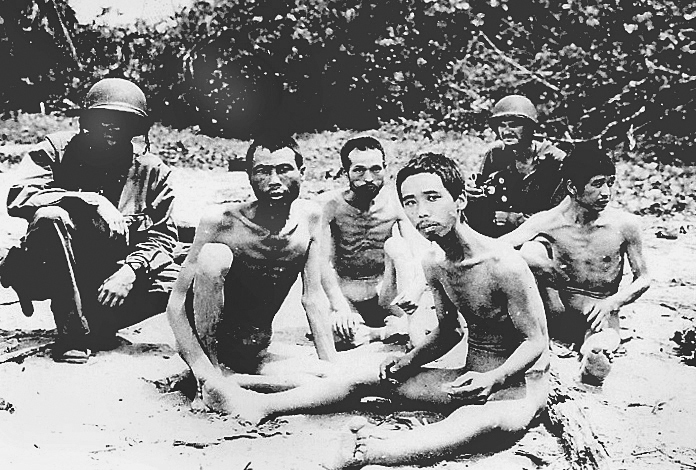 Japs turn into vermin to be killed and to get their skulls bashed in, flags kept and their golden teeth saved for booty. Soldiers become killers and many regret killing, but the great majority of men go after and kill these barbaric Japanese without conscience. As darkness falls the battlefield takes on a new form. Wildlife in the marshes and brush brings out the local varmints in search of food. Typically Japanese soldiers roam around at night. Their split toed shoes are designed to help them move with a minimum of noise, so they slip through lines and cut throats of men found asleep in foxholes. Men report having seen Jap silhouettes in a lightning flash during a thunderstorm and then killing them right on the spot. Soldiers typically dig two and three men size foxholes and take turns being on guard. On Leyte many foxholes were dug in marshy area and often filled with water. This breeds the body fungus they called “jungle rot”. Many men were also attacked with leaches, mosquitoes and suffered dysentery, malaria and dengue fever. Grant Cook was a soldier in one of the most adverse places on the planet and everyone can be proud of him. One can read the pages of history that show the brutality and horror men have to endure who live through combat and just simply find it is too painful to talk about. Made by an unknown interviewer with Grant Cook and his wife, Lois. Grant makes reference to an atrocity in his interview. Here is acknowledgement in this Leyte photograph. Read the sign. 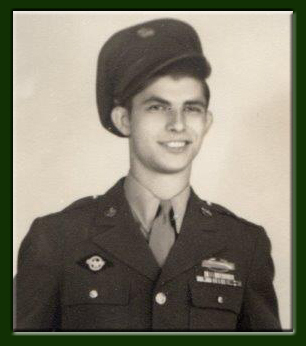 Mr. Cook, 86, passed away peacefully Sunday December 6, 2009 at his home. He was born in Hamtramck on August 4, 1923 to that late August & Martha (Greca) Cook. He married the former Lois Limbeck on August 3, 1946. She preceded him in death on December 4, 2006. 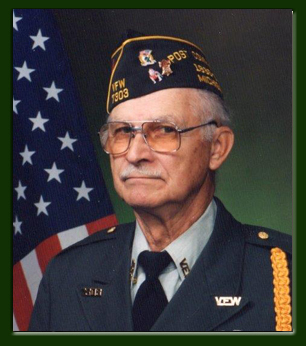 Grant was a veteran of the U. S. Army serving in the 96th Infantry Divison. Grant was retired from Continental Container Co. of Midland. He was a member of St. Mary’s Church, K of C Council 2986, American Legion Post 225, Fraternal Order of Eagles 2110 and a Life Member & Past Commander of VFW Post 7303 of Beaverton. Interment will be in St. Mary’s Mt. Calvary Cemetery with military honors by Standish American Legion Post 104 and VFW Post 3724. A Vigil Service & K of C Bible presentation will be held. He is survived by his children Gary & Linda Cook, Glen & Barbara Cook, Gerald & Barbara Cook, Greg & Cheryl Cook, Gene & Rebecca Cook, Gavin Cook, Gwayne & Billie Cook and Gail & Mike Austin; 17 grandchildren and 7 great grand children; a sister Colleen & Kurt Kleinhans; a brother Carlton & Judy Cook. He was predeceased by a brother August Cook. Cook family: The lady in the nurse's uniform is Colleen (Cook) Kleinhans who was a volunteer Red Cross nurse as well as Grant's sister. From left to right in the back row: Dorien Chipp, who is a cousin; Grant Cook; and Patty Chipp, who is also Grant's cousin.